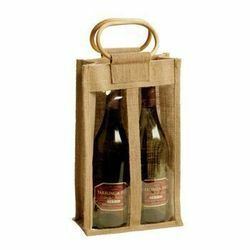 We are engaged in providing a wide range of customized Jute and Canvas Wine Bottle Bags in single, Twin , Four and Six Packs . - Materials Used: jute, Cotton And Other Natural Fabrics. Our firm specializes in providing our prestigious clients with a quality array of Cotton Paper Wine Bags. These wine bags offered by us are admired among the esteemed clients, owing to their optimum performance, low maintenance, strong construction and longer functional. Customers can buy from us designer jute wine bags in attractive colour combinations and designs. These wine bags are made of half jute and half clear plastic which makes it unique and durable in quality standards. 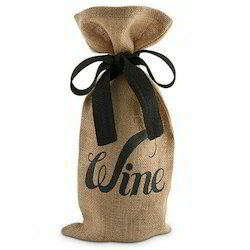 These designer jute wine bags are offered with strong cane handles and are an indispensable bar accessory. Leveraging on the skills of our professionals, we are involved in offering best quality of Two Bottle Jute Wine Bag.